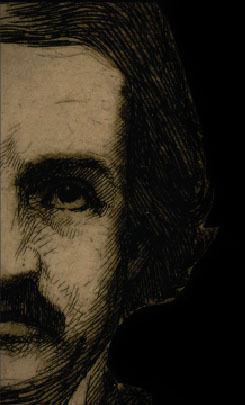 Poet, literary critic, visionary, inventor of the detective story, master of the macabre — this was Edgar Allan Poe. Recognized as one of the most influential and widely read American authors of the nineteenth century, the writer's work fascinates schoolchildren and scholars alike. On his two-hundredth birthday, Poe yet lives. His poem, "The Raven," is one of the most memorable in the English language, and his highly original tales, including "The Pit and the Pendulum" and "The Tell-Tale Heart," continue to amaze and terrify. Celebrating the bicentennial of Edgar Allan Poe, From Out That Shadow was created out of a partnership between the Mary and David Harrison Institute of American History, Literature, and Culture and the Albert and Shirley Small Special Collections Library at the University of Virginia, and the Harry Ransom Center at the University of Texas at Austin. This website is the University of Virginia Library's digital complement to From Out That Shadow: the Life and Legacy of Edgar Allan Poe. The exhibition was on view from March 7, 2009, through August 1, 2009, in the main gallery of the Harrison Institute / Small Special Collections Library, and from September 2009 to January 2010 at the Harry Ransom Center.